FOG Ancients 15mm. Sam (Syrians) beat Benny (Early Carthaginians). DBR 15mm. Steve (Muslim Indians) beat Philip (Maratha Indians) 9-1. Flames of War. 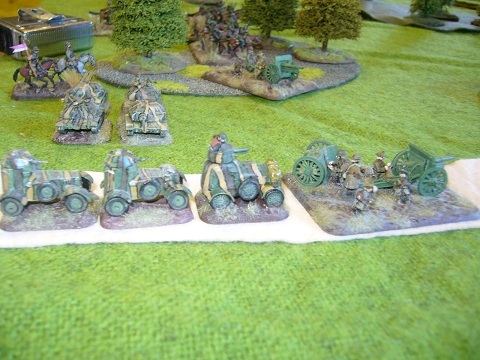 Kendall (21 Panzergrenadiers) beat Ken (Herman Goring armour) 5-2 in an encounter mission. Tigers on both sides of this game, but Kendall's had all the good skills! NICON was held in Hamilton this year. Mark and Philip had a 25mm DBMM game, Polybian Romans v Kushite Egyptians. The Roman infantry advanced in nice orderly lines down the centre of the table to attack the Kushite infantry who were defending a riverbank (so far back that they are out of this picture). The Roman advance was going well, but the Kushite chariots got around their flank and into the baggage. A win to the Kushites. Dan made a return to the club with his Skaven army, and defeated Rob's Chaos force. Andrew and Brett had a FOG-N game. The French Guard Corps was defeated by the Italian army, and the death of Napoleon brought an early end to the Napoleonic wars. Benny and Philip had a 25mm DBMM game, Marian Romans v Kushite Egyptians. There was a lot of manoeuvring by the cavalry and chariots, but not enough actual fighting, so we ended with a draw. A useful practice game for NICON though, coming up in a couple of weeks. 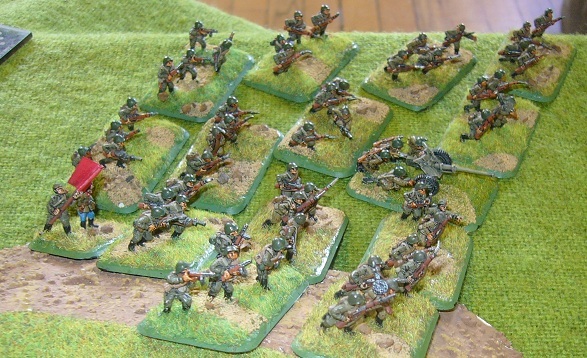 Meanwhile on the painting table, some more Fallschirmjager are coming along. And in other club news, a reminder about the bring and buy next weekend, our 5th Sunday meeting. NICON is on the following weekend in Hamilton (Queen's Birthday weekend), and then at the following club meeting on the 26th we are doing another Waterloo refight with a reanimated Napoleon presumably. There were a couple of FOG-N games, Brett (French) v Rob (Poles), and Kendall (Saxons) v Philip (Netherlands) with a 22-3 win to Kendall. There was also a large Flames of War multi-player game. It was victory to the Germans over the US forces in practice for the BF doubles comp coming up. Horrendous casualties all round (although the game went for 4 hours!). A FoW bring-and-buy/swap meet is planned for the last meeting in May (30th May) so have a rummage through your spares and unwanted box and give it a new home where it can be used! Natcon was held in Christchurch at the Woolston Workingmen's Club. The convention overall was very successful, and the Christchurch club won the club trophy. There were 12 players in the FOG Ancients competition, 11 in DBA ancients, 6 in DBR Renaissance 15mm, 16 in mid-war FOW and 14 in late war. 40K had the largest field with 40 players, and there were about a dozen in Warmachine. There were only few of us attending from the NSWC this year. Robbie came 2nd in Flames of War, Late War, using his British Armour. Mike was 3rd in Field of Glory, using his Koreans this time with cavalry instead of cataphracts. In DBR Stu was 2nd using Regency French, and Philip was last using Scots Covenanters with too many proxy figures! Stu and Philip also played in the one day DBA tournament. This was the first time that a DBA tournament has been held at the Nationals, although there have been demo games in the past. Natcon 2012 will be held in Hamilton. The proposed bid from Auckland didn't go ahead due to the lack of a venue. The club committee has been re-elected, and the annual membership fees remain at $50. Several interesting games at the club today. Al and Bruce had a 1/300 moderns game, with British and US Marines in a desert training exercise. The game also doubled as a photo shoot to provide illustrations for the new modern army lists. Mike and Philip had a FOG ancients game, using Koreans and Muslim Sultanates (a DBR Muslim Indian army morphed into a FOG army). The few units of Indian infantry outfought their Korean counterparts, but the Korean horse archers won the cavalry fight and won the game overall. There were a couple of FOW games. Kendall used US Armor against Jason who had Fallschirmjager. A large hill in the centre of the table with some forests around the edges made for some interesting terrain. In the other game, Ken's Germans won a close struggle with Steve's Russians. It was a 1750 point game, and both sides held on with great losses until a Brumbar assault finally took an objective. After the game we drooled over the Firestorm Market Garden game that Steve won at Equinox last week. Some thought is going into a large Market Garden game sometime in the future. We are also planning a Waterloo refight in May or June, perhaps around the anniversary of the battle. Equinox was held in the Freemans Bay hall this weekend. 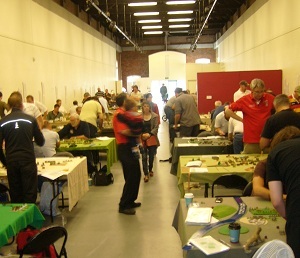 Most of the hall was taken up with Games Workshop games, with a smaller Flames of War tournament as well. Rob came 3rd in Warhammer fantasy, using Demons of Chaos. Our club did well in FOW taking out the top four places, Michael first, Steve second, Kit third, and Ken fourth. A good result for the Shore Boys! The Equinox convention is coming up next weekend, so there were a couple of training games. In the first, Steve's Russians overwhelmed Ken's Americans who were defending in a cauldron scenario. In the second, Kit's Commonwealth forces made a night attack on Steve's Russians. End result, two 6-1 wins to Steve. That's all the games at the club today, but the others of us there spent the time prepping figures, painting the odd Matilda for Equinox, and scheming about the FoW doubles. Just a quiet one at the club with Kendall (US 2nd Armored Tank Company) attacking in a No Retreat mission against Lyndon (US 101st Airborne Parachute Company). A 6-1 win for the tanks. Notable events were the Para�s Guards Armoured allies springing an ambush to destroy a US tank platoon before getting massacred by the remaining 10 US tanks and the Paras getting 12 aircraft in support and the Tanks shooting down 8 of them! We had a good contingent at the Worlds: Ken, Kit, and Robbie in the Flames competition, Michael in FoG, and Brett, Grant, Ian, John, Stu, and Philip in DBR. John was the highest placed NZ player in DBR, winning 3rd place in a field of 25. Shed 11, venue of the competitions. Quite a spacious venue, with plenty of space around the tables. 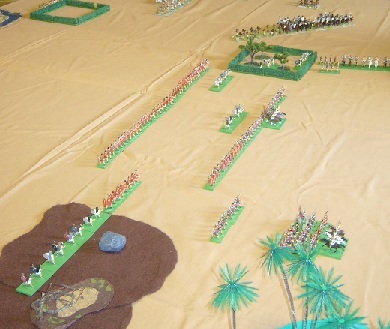 There were competitions in DBA, DBR, DBM, Flames of War, and Field of Glory ancients. Olympian Games visiting from Australia had a trade stand. Flames of War game at IWF 2011. The old Airfix Fort Sahara makes an appearance. As usual with FoW competitions, there was lots of really good terrain set up on the tables. 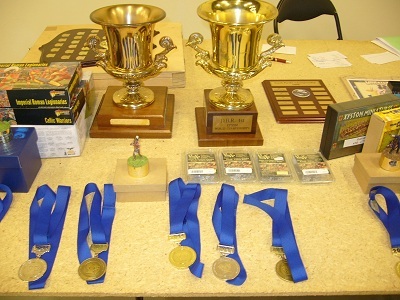 Trophies and prizes on offer for the competitions. Mike's Korean army in action in a FOG game at the tournament. Armies with high quality Knights and lots of horse archers were quite prevalent, but there was also an Inca army in the competition. Three Flames of War games and two DBR games at the club today. The forthcoming Battlecry and IWF conventions are focussing our attention! In the morning Lee's Germans took on Kit's Poles in an early war game. Then in the afternoon a change to late war, with Lee's Germans against Steve's Russians. Rob (British) won a game against Lyndon (US Airborne), but with the US forces claiming the moral victory as they left the field. Kendall offered a couple of training games in DBR 15mm with Brett and Philip, both using Muslim Indian armies. Two wins to the elephant armies against the later Imperialists. An extra meeting today, being the fifth Sunday. Sam had a couple of FoG Ancients games. Firstly a rematch of last week's game with Scott, this time a decisive win to the Chinese army. In the second game Philip's Late Egyptians also beat the Syrians, but had their own baggage camp looted! Ken and Michael had an early war Flames of War game. Ian and Kendall had a 15mm DBR training game, with the Spanish and Austrian imperial armies. Lots of activity at the club again today. There was some Warhammer 40K, something not often seen at the club. Ian and Richard had a 15mm DBR game in training for the Worlds. Sam and Scott had a 15mm FoG Ancients game, with the Syrians defeating the Han Chinese. The big event that we have been preparing for some time was the Waterloo refight using the FoG Napoleonics rules. There had been lots of painting and basing in the last few weeks, and the terrain was specially prepared for the game. It was an all-day game running from 9am to 9pm, with 9000 points of figures on the table. We had a lot of exciting combats and a lot of pizza eating. Eventually Napoleon (Andrew) and Marshalls Mike, Rob and Steve defeated the allied army of Wellington (Kit) and Orange (Philip). Kendall's Prussians did well when they arrived, but too late to save the allies. Altogether an excellent game and a great club project. The picture here shows d'Erlon's corps on the right flank of the French line. Ahead of them is the Grand Battery. At the top of the picture is Hougomont. More pictures on the Napoleonic page. A good turnout at our first meeting saw four games being played, several visitors, and lots of industrious re-basing of figures getting ready for the Waterloo refight next meeting. Ian and Philip had a 15mm DBR game, getting in some practice for the Worlds, with a 10-0 win to the Indians. Al and Bruce had a 1/300 Moderns game, an Anglo/American training scenario set in Iraq. Michael and Sam had a rematch of their FoG game in December, this time the win going to Michael's Koreans against the Syrians. Robbie used his Polish army for the first time in a FoG Napoleonics game, taking on Brett's Austrians who were defending a large hill.